A future remote sensing platform orbiting above Earth will enable us to better understand, on a global basis, the factors that influence soil moisture fluctuations. This will enable people everywhere to plant crops more intelligently and mitigate the effects of natural hazards. Eni Njoku (MIT, MS '74, PhD '76) is Senior Research Scientist in the NASA Jet Propulsion Laboratory at Cal Tech. Main research interests: applications of spaceborne microwave sensing to studies of climate, land surface hydrologic processes and the global water cycle. Eni G. Njoku is a Senior Research Scientist in the NASA Jet Propulsion Laboratory (JPL) at the California Institute of Technology. His main research interests are applications of spaceborne microwave sensing to studies of land surface hydrologic processes and the global water cycle. Dr. Njoku holds a BA in Electrical Sciences/Natural Sciences (1972) from Cambridge University (Clare College) in England. He earned both the MS (1974) and the PhD (1976) in Electrical Engineering from MIT. His long career at JPL began as a postdoctoral research associate with the National Academy of Sciences/National Research Council and as a research scientist. From 1993 to 1994, he was Section Manager of the Geology and Planetology Section, and two years later joined the Aqua Advanced Microwave Scanning Radiometer (Aqua/AMSR-E) science team. In 2001, Dr. Njoku was appointed Project Scientist of the Hydros Mission and Principal Scientist. He held these positions until 2006, on promotion to Senior Research Scientist. Since 2008, Dr. Njoku has also served as Project Scientist for the SMAP Mission and as Principal Scientist and Supervisor of the Water and Carbon Cycles Group. Additionally, Dr. Njoku served as Program Scientist for the Ocean Processes Branch and Earth Science Data and Information Systems at the NASA Headquarters (1986-1990). His exceptional research earned him a NASA Exceptional Service Medal (1985) and four NASA Group Achievement Awards (most recently, the 2013 Award to the SMAPVEX12 Field Campaign Team). Dr. Njoku was named a 1995 Fellow of the Institute of Electrical and Electronics Engineers. He has held visiting faculty posts in the US and abroad. He served as Senior Lecturer in the Dept. of Electrical Engineering at the Institute of Management & Technology in Enugu, Nigeria (1980-1981); and as Associate Professor in the Dept. of Engineering at Harvey Mudd College (1984-1986). In 2001, Dr. Njoku returned to MIT as an MLK Visiting Professor hosted by the Department of Civil Engineering and Environmental Studies. Tsang, L., E. Njoku, and J. A. Kong (1975): Microwave thermal emission from a stratified medium with nonuniform temperature distribution, J. Appl. Phys., 46, 5127-5133. Njoku, E. G. and J. A. Kong (1977): Theory for passive microwave remote sensing of near-surface soil moisture, J. Geophys. Res., 82, 3108-3118. Tsang, L., J. A. Kong, E. G. Njoku, D. H. Staelin, and J. W. Waters (1977): Theory for microwave thermal emission from a layer of cloud or rain, IEEE Trans. Ant. & Propagat., AP-25, 650-657. Njoku, E. G. (1980): Antenna pattern correction procedures for the Scanning Multichannel Microwave Radiometer (SMMR), Boundary-Layer Meteorol., 18, 79-98. Njoku, E. G., J. M. Stacey, and F. T. Barath (1980): The Seasat Scanning Microwave Radiometer (SMMR): Instrument description and performance, IEEE J. Oceanic Eng., OE-5, 100-115. Hofer, R., E. G. Njoku, and J. W. Waters (1981): Microwave radiometric measurements of sea surface temperature from satellite: First results, Science, 212, 1385-1387. Njoku, E. G. (1982): Passive microwave remote sensing of the Earth from space - A review, Proc. IEEE, 70, 728-750. Njoku, E. G. (1983): Reflection of electromagnetic waves at a biaxial/isotropic interface, J. Appl. Phys., 54, 524-530. Njoku, E. G. and L. Swanson (1983): Global measurements of sea surface temperature, wind speed, and atmospheric water content from satellite microwave radiometry, Mon. Wea. Rev., 111, 1977-1987. Njoku, E. G. (1985): Satellite-derived sea surface temperature: Workshop comparisons, Bull. Am. Met. Soc., 66, 274-281. Njoku, E. G. and E. K. Smith (1985): Microwave antenna temperature of the Earth from geostationary orbit, Radio Science, 20, 591-599. Njoku, E. G., T. P. Barnett, R. M. Laurs, and A. C. Vastano (1985): Advances in satellite sea surface temperature measurement and oceanographic applications, J. Geophys. Res., 90, 11573-11586. Kerr, Y. and E. G. Njoku (1990): A semiempirical model for interpreting microwave emission from semiarid land surfaces as seen from space, IEEE Trans. Geosci. Rem. Sens., 28, 384-393. Entekhabi, D., H. Nakamura, and E. G. Njoku (1994): Solving the inverse problem for soil moisture and temperature profiles by sequential assimilation of multifrequency remotely sensed observations, IEEE Trans. Geosci. Rem. Sens., 32, 438-448. Davis, D. T., Z. Chen, J.-N. Hwang, L. Tsang, and E. G. Njoku (1995): Solving inverse problems by Bayesian iterative inversion of a forward model with applications to parameter mapping using SMMR remote sensing data, IEEE Trans. Geosci. Rem. Sens., 33, 1182-1193. 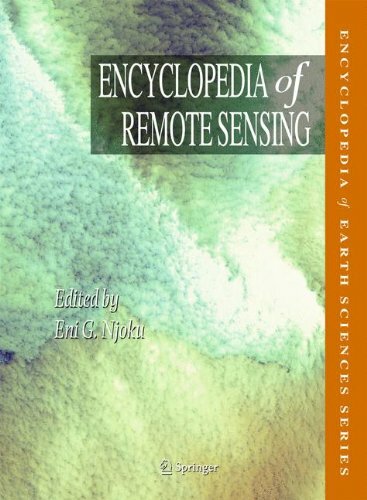 Njoku, E. G. and D. Entekhabi (1996): Passive microwave remote sensing of soil moisture, J. Hydrology, 184, 101-129. Chehbouni, A., D. Lo Seen, E. G. Njoku, J. P. Lhomme, A. B. Monteny, and Y. H. Kerr (1997): Estimation of sensible heat flux over sparsely vegetated surfaces, J. Hydrology, 188-189, 855-868. Njoku, E., Y. Rahmat-Samii, J. Sercel, W. Wilson, and M. Moghaddam (1999): Evaluation of an inflatable antenna concept for microwave sensing of soil moisture and ocean salinity, IEEE Trans. Geosci. Rem. Sens., 37, 63-78. Njoku, E. and L. Li (1999): Retrieval of land surface parameters using passive microwave measurements at 6 to 18 GHz, IEEE Trans. Geosci. Rem. Sens., 37, 79-93. Njoku, E. G., W. J. Wilson, S. H. Yueh, and Y. Rahmat-Samii (2000): A large-antenna microwave radiometer-scatterometer concept for ocean salinity and soil moisture sensing, IEEE Trans. Geosci. Rem. Sens., 38, 2645-2655. Njoku, E., W. Wilson, S. Yueh, S. Dinardo, F. Li, T. Jackson, V. Lakshmi, and J. Bolten (2002): Observations of soil moisture using a passive and active low frequency microwave airborne sensor during SGP99, IEEE Trans. Geosci. Rem. Sens. 40, 2659-2673. Njoku, E., T. Jackson, V. Lakshmi, T. Chan, and S. V. Nghiem (2003): Soil moisture retrieval from AMSR-E, IEEE Trans. Geosci. Rem. Sens., 41, 215-229. Li., L., E. Njoku, E. Im, P. Chang, and K. St. Germain (2004): A preliminary survey of radio-frequency interference over the U. S. in Aqua AMSR-E data, IEEE Trans. Geosci. Rem. Sens., 42, 380-390. Entekhabi, D., E. Njoku, P. Houser, M. Spencer, T. Doiron, J. Smith, R. Girard, S. Belair, W. Crow, T. Jackson, Y. Kerr, J. Kimball, R. Koster, K. McDonald, P. O'Neill, T. Pulz, S. Running, J. Shi, E. Wood, and J. van Zyl (2004): The Hydrosphere State mission (HYDROS): An earth system pathfinder for global mapping of soil moisture and land freeze/thaw, IEEE Trans. Geosci. Rem. Sens., 42, 2184-2195. Njoku, E., P. Ashcroft, and L. Li (2005): Statistics and global survey of radio-frequency interference in AMSR-E land observations, IEEE Trans. Geosci. Rem. Sens., 43, 938-947. Crow, W., T. Chan, D. Entekhabi, P. Houser, A. Hsu, T. Jackson, E. Njoku, P. O'Neill, J. Shi, and X. Zhan (2005): An observing system simulation experiment for Hydros radiometer-only soil moisture products, IEEE Trans. Geosci. Rem. Sens., 43, 1239-1303. Njoku, E.G. and T. K. Chan (2006): Vegetation and surface roughness effects on AMSR-E land observations, Rem. Sens. Environ., 100, 190-199. Dunne, S., D. Entekhabi, and E. Njoku (2007): Impact of multi-resolution active and passive microwave measurements on soil moisture estimation using the ensemble Kalman smoother, IEEE Trans. Geosci. Rem. Sens., 45, 1016-1028. Reichle, R. H., R. D. Koster, P. Liu, S. P. Mahanama, E. G. Njoku and M. Owe (2007): Comparison and assimilation of global soil moisture retrievals from AMSR-E and SMMR, J. Geophys. Res., 112, D09108, doi:10.1029/2006JD008033. Waliser, D., K.-W. Seo, S. Schubert and E. Njoku (2007): Global water cycle agreement in the climate models assessed in the IPCC AR4, Geophys. Res. Lett., 34, L16705, doi:10.1029/2007GL030675. Piepmeier, J. R., D. G. Long and E. G. Njoku (2008): Stokes antenna temperatures,IEEE Trans. Geosci. Rem. Sens., 46, 516-527. Entekhabi, D., E. Njoku, et al. (2010): The Soil Moisture Active Passive (SMAP) Mission, Proceedings of the IEEE, 98, 704-716. Das, N. N., B. P. Mohanty, and E. G. Njoku (2010): Profile soil moisture across spatial scales under different hydroclimatic conditions, Soil Science, 175, 315-319. Huang, S., L. Tsang, E. Njoku, and K. Chan (2010): Backscattering coefficients, coherent reflectivities and emissivities of randomly rough soil surfaces at L-band for SMAP applications based on numerical solutions of Maxwell Equations in three-dimensional simulations, IEEE Trans. Geosci. Rem. Sens., 48, 2557-2568. Das, N. N., D. Entekhabi, and E. G. Njoku (2011): An algorithm for merging SMAP radiometer and radar data for high resolution soil moisture retrieval, IEEE Trans. Geosci. Rem. Sens., 49, 1504-1512. Konings, A. G., D. Entekhabi, S. K. Chan, E. G. Njoku (2011): Effect of radiative transfer uncertainty on L-band radiometric soil moisture retrieval, IEEE Trans. Geosci. Rem. Sens., 49, 2686-2698. Kim, S., L. Tsang, J. T. Johnson, S. Huang, J. J. van Zyl, E. G. Njoku (2012): Soil moisture retrieval using time-series radar observations over bare surfaces, IEEE Trans. Geosci. Rem. Sens., 50, 1853-1863.